As the summer months are finally upon us, the weather in Antarctica is spectacular. We have been having beautiful sunny days with very little wind and temperatures in the mid–30's. I cannot believe I am saying this, but after the weather we have had, these days truly are warm enough to work outside in a t–shirt. It is amazing. I cannot believe it. Accompanying all this warm weather is the encroaching ice breakup. The ice is starting to break up a mere 25 miles from here. 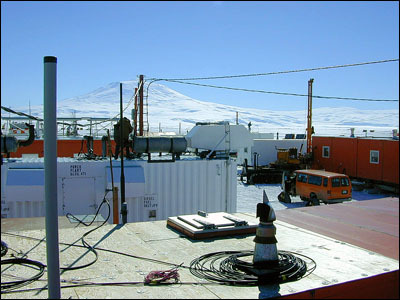 In a few weeks the icebreaker will be coming through McMurdo Sound and we will be able to start getting ships into port. 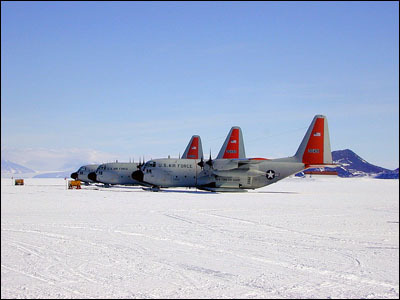 Our airport has been located just a couple of miles out on the sea ice of McMurdo Sound. That area is a convenient location to town, and because it is ice rather than snow, planes can land on their wheels rather than on skis. That also allows larger and heavier planes to land. As the ice has been getting thinner, the heavier planes stopped coming here several weeks ago. It is time to move our airport to a more stable location. That location is Williams Field, more commonly known as Willy Field. It is about 7 miles from here out on the Ross Sea. The sea ice there is around 160 feet thick. At Willy Field there are many feet of packed snow over all the ice. All the planes that land there have to be equipped with skis. That means that we will only get the lighter planes for the next month or so. Then we will set up another airport which will be on ice again so that we can get larger planes, but it will be much further away. That will last until the last plane leaves here sometime around the end of February. After that time, no planes will be able to land until after the winter, sometime in August. This week we had to move the entire airport from the ice runway near town out to Willy Field. 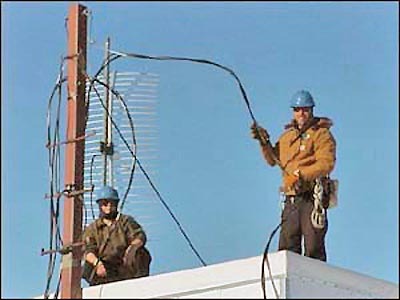 All of the electricians became linemen for this job. We had to go out and unhook power from all the buildings out there. 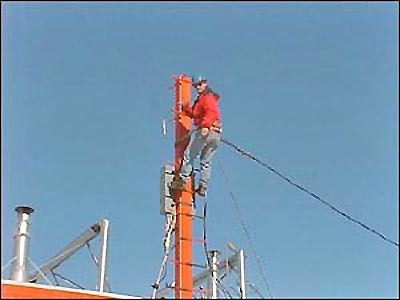 That meant climbing power poles and up on top of the buildings. There were about 12 of us working on it and we got it all down in under two hours. All of the buildings are built on skis. After all the power is down, they take diesel heaters and melt the skis out of the ice. 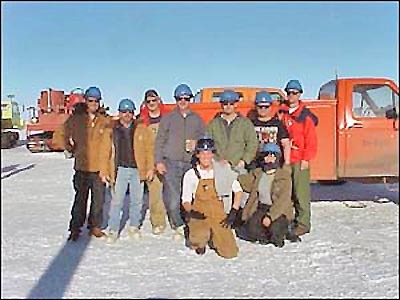 Then they hook up each building to a large tractor and haul it across the ice to Willy Field. 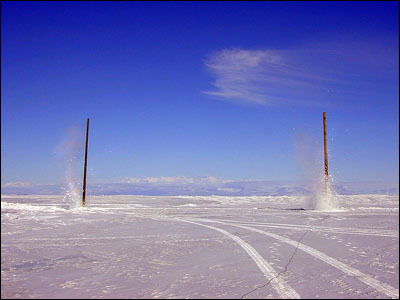 The power poles had to be blasted out of the ice. 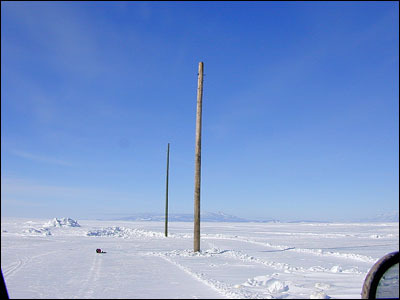 Everyone expected to see the poles fly up out of the ice, but no such luck. What you see in the picture was all there was. There was not much of an explosion to see and the poles remained standing. But they were able to be lifted right out of the ice. They moved buildings all night long. 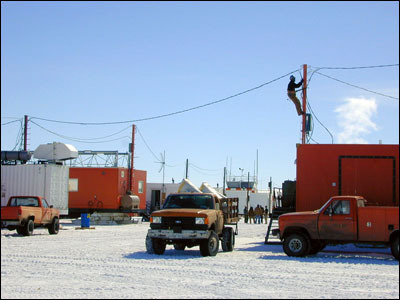 The next day we went out to Willy and had to hook up all the power. That was a much larger job and took us about 6–7 hours. We still broke all the past records. After all of the preliminary work that we did digging out runway lights, the new airport was up and running in less than 24 hours after the old one closed. Not a bad job. 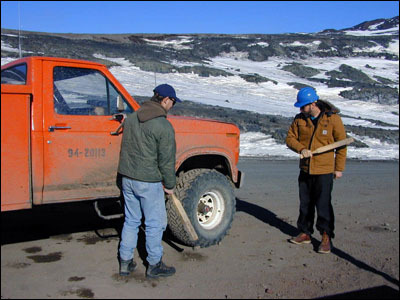 A fun little side note is that when you drive out to Willy Field, just at the point where the land and sea meet, you always have to stop the truck, get out and beat the truck with a wooden bat to shake all of the mud and dirt off the truck. They want to keep as little black dirt off the ice as possible because it heats up and melts the ice, causing the roads to get really messed up. So we all get to work out our frustrations beating up on the trucks. Needless to say none of our trucks look so great anymore. We are getting all new ones when the ships start coming in. The ones we have now are pretty old and worn. Christmas will be here very soon. There are several Christmas parties planned and of course there will be a big dinner on Christmas day. We have been waiting for package mail for about 7 weeks now. All other mail and cargo takes priority over our mail. 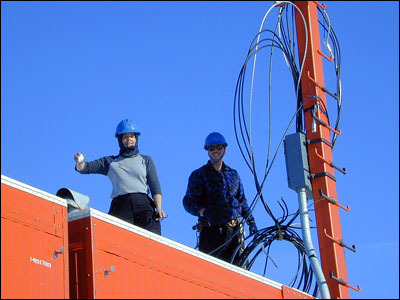 Science of course is the first priority, followed by construction materials, and many other things. 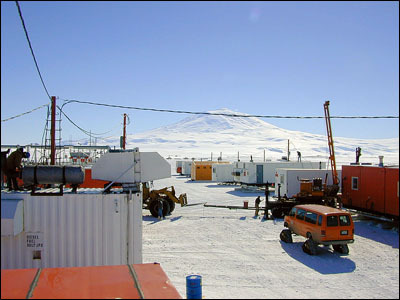 I had my Christmas cards mailed down here so that I could post them all from Antarctica. Finally, today, just in time for Christmas, they flew in 23,000 pounds of package mail for us. I am afraid Christmas cards will be a bit late this year. 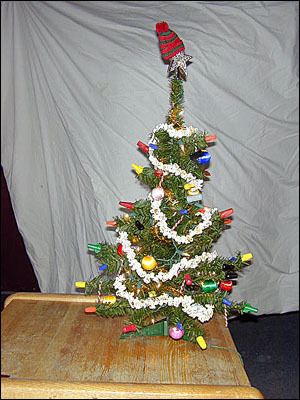 I skua–ed a small artificial Christmas tree for my room. There were a few ornaments that came with it, but not much. So I made some candy canes out of red and white electrical wire, and used different colored wire nuts on the ends of the limbs. My roommate strung some popcorn to go on it. The only thing I did not have were lights. Then today I got a care package from my friend Gayle, and lo and behold — Christmas lights. So I am all set.